This is the time of year for celebrations of creativity that may not show up on traditional calendars: Dot Day and the Global Cardboard Challenge. I’ve written about both before (Dot Day, Cardboard Challenge), but if you haven’t had a chance to celebrate yet it doesn’t hurt to have a reminder. I’m grateful for the “Ish” mentality of Dot Day, that day of celebrating our creative efforts with appreciation and patience, since I’m already a day late. 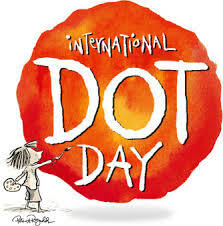 Dot Day is celebrated September 15ish, so any time around then is fine for a celebration. If you haven’t yet read Peter Reynold’s Dot Day, you really must. It tells the story of a caring teacher who helps a young girl break through fear of judgment to find joy in her own creativity. Take a look, then think about the day such dots can inspire. The handbook is free. What are you waiting for? Or perhaps you are more interested in 3-dimensional creations. In that case, you’ll want to celebrate the Global Cardboard Challenge October 10, 2015. This is a day to celebrate children’s creativity, and support them in making something from cardboard, recycled materials, and imagination. 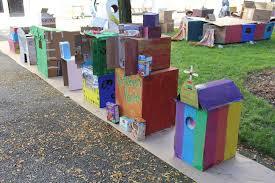 The Cardboard Challenge was inspired by Caine’s Arcade, an Internet sensation of a few years ago. On the off chance you missed it, here’s the beginning. It has grown to an international event sponsored by schools, families, clubs and all manner of civic organizations. You can join in at home or with your class. It is a time for celebrations! « What Data Do We Really Need? Really.